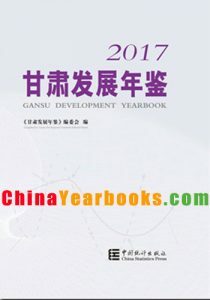 I. Gansu Development Yearbook, edited by the Gansu development yearbook editorial board and published by china statistics press, is a large-scale domestic and international public offering comprehensive annual publication. It records comprehensively Gansu economic and social development situation by the large amount of reliable data, and is an important tool to understand the situation of the province, city, county and conduct a scientific decision-making, consult and research for every level party and government leaders, economic management department, enterprise and public institution, research departments and domestic and foreign investors. II. The yearbook is the ninth volume since founded, which is all the in Chinese-English and equipped with electronic version, records mainly Gansu economic and social development situation in 2017, but its statistics materials have traced back in time. III. The yearbook contains the following two parts: The first part contains Featured Articles, Survey, National Economy, Construction, Survey & Mapping, Traffic Communication, Government Finance and Financial, Economy & Management, Social Undertaking, People’s Living Conditions, Region and Lanzhou New Area Overview total 10 chapters. The second part contains total 23 sections and chapters: General Survey; Population; National Accounts; Employment and Wages; Prices; People’s Living Conditions; Government Finance and Financial Intermediation; Resources and Environment; Energy; Investment in Fixed Assets; Foreign Trade and Economic Cooperation; Agriculture; Industry; Construction; Wholesale and Retail Trades; Hotels, Catering Services and Tourism; Transport, Postal and Telecommunication Services; Education & Science and Technology; Public Health, Social Services and Social Security; Culture and Sports; City; Ethnic Minority Autonomous Area; Lanzhou New Area. For the convenience of using information for the readers, statistics have a brief introduction at the beginning of each part. In addition, explanatory notes on main statistical indicators are provided at the end of each part. IV. The yearbook style is divided into contents, subhead and entry three levels, and entry as the basic structural unit. The entry titles are in bold and add【】. V. In comparison with Gansu Development Yearbook-2017, following amendments were mainly made in content of this yearbook: In the first part, of the chapter “General Situation of Prefectures & Counties and Lanzhou New Area”, delete the content of counties, renamed as “Region and Lanzhou New Area Overview”, Increased “Traffic and Communications” content. In the second part, the chapter of “Agriculture” and “National Accounts” are adjusted the historical year data of relevant indicators according to the results of Third Agricultural Census; of the chapter “General Survey”, delete the table of “Average Daily Social and Economic Activities in Gansu”; of the chapter “Agriculture”, delete the indicator of “Cultivated Area”; of the chapter “Education & Science and Technology”, delete the indicator of “Dropout rate”. VI. As the methods of statistical system reform, some of the caliber of statistical indicators, including the scope and computational method change and please note that when used. The presentation data is provided by the units and some are preliminary statistics, if they does not accord with the statistical tables to tables shall prevail. VII. Please refer to the newly published version of the Yearbook for updated historical data. The units of measurement used in this yearbook are internationally standard measurement units, statistical discrepancies on totals and relative figures due to rounding are not adjusted in the Yearbook. VIII. Notations used in the yearbook: (blank space) indicates that the figure is not large enough to be measured with the smallest unit in the table, or data are unknown, or are not available; “#” indicates a major breakdown of the total. The edit and publishing of Yearbook were strongly supported by the departments under the provincial leadership, relevant enterprises and public institutions. We express our sincere thanks! 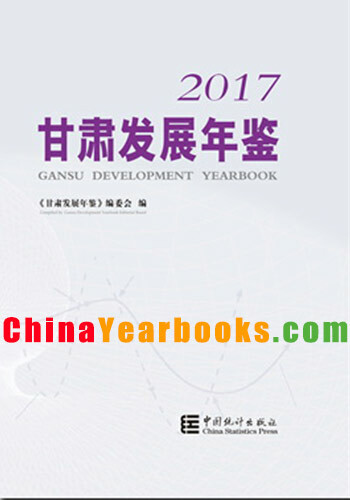 Gansu Development Yearbook, edited by the Gansu development yearbook editorial board and published by china statistics press, is a large-scale domestic and international public offering comprehensive annual publication. It records comprehensively Gansu economic and social development situation by the large amount of reliable data, and is an important tool to understand the situation of the province, city, county and conduct a scientific decision-making, consult and research for every level party and government leaders, economic management department, enterprise and public institution, research departments and domestic and foreign investors. The yearbook is the eighth volume since founded, which is all the in Chinese-English and equipped with electronic version, records mainly Gansu economic and social development situation in 2016, but its statistics materials have traced back in time. III. The yearbook contains the following two parts: The first part contains Featured Articles, Survey, National Economy, Construction, Survey & Mapping, Government Finance and Financial, Economy & Management, Social Undertaking, People’s Living Conditions, General Situation of Prefectures & Counties and Lanzhou New Area, total 9 chapters. The second part contains total 23 sections and chapters: General Survey; Population; National Accounts; Employment and Wages; Prices; People’s Living Conditions; Government Finance and Financial Intermediation; Resources and Environment; Energy; Investment in Fixed Assets; Foreign Trade and Economic Cooperation; Agriculture; Industry; Construction; Wholesale and Retail Trades; Hotels, Catering Services and Tourism; Transport, Postal and Telecommunication Services; Education & Science and Technology; Public Health, Social Services and Social Security; Culture and Sports; City; Ethnic Minority Autonomous Area; Lanzhou New Area. For the convenience of using information for the readers, statistics have a brief introduction at the beginning of each part. In addition, explanatory notes on main statistical indicators are provided at the end of each part. The yearbook style is divided into contents, subhead and entry three levels, and entry as the basic structural unit. The entry titles are in bold and add【】. In comparison with Gansu Development Yearbook-2016, following amendments were mainly made in content of this yearbook: In the first part, of the chapter “General Situation of Prefectures and Counties”, added the content of Lanzhou New Area, renamed as “General Situation of Prefectures & Counties and Lanzhou New Area”; delete part of chapters; of the chapter “Transport, Communication and Post “, incorporated into the chapter of “National Economy”. In the second part, added the chapter of “Lanzhou New Area”; of the chapter “Prices”, according to changes of classification of retail price indices and consumer price indices in statistical survey and report systems, corresponding adjusts are made; of the chapter “Foreign Trade and Economic Cooperation”, some detailed indicators and tables are deleted; of the chapter “Education & Science and Technology”, tables of enterprise innovation related are added; of the chapter “Public Health, Social Services and Social Security”, tables of safe production aspects are added, simultaneously, part of the indicators of civil affairs and cause of the disabled, are adjusted significantly. As the methods of statistical system reform, some of the caliber of statistical indicators, including the scope and computational method change and please note that when used. The presentation data is provided by the units and some are preliminary statistics, if they does not accord with the statistical tables to tables shall prevail. VII. The units of measurement used in this yearbook are internationally standard measurement units, statistical discrepancies on totals and relative figures due to rounding are not adjusted in the Yearbook. VIII. Notations used in the yearbook: (blank space) indicates that the figure is not large enough to be measured with the smallest unit in the table, or data are unknown, or are not available; “#” indicates a major breakdown of the total; and “*” or “①”indicates footnotes at the end of the table. 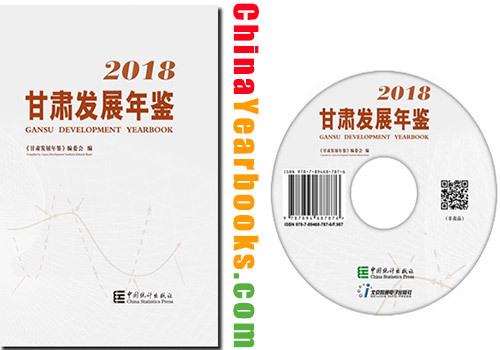 I. Gansu Development Yearbook, edited by the Gansu development yearbook editorial board and published by china statistics press, is a large-scale domestic and international public offering comprehensive annual publication. It records comprehensively Gansu political, economic, legal and social development situation by the large amount of reliable data, and is an important tool to understand the situation of the province, city, county and conduct a scientific decision-making, consult and research for every level party and government leaders, economic management department, enterprise and public institution, research departments and domestic and foreign investors. II. The yearbook is the seventh volume since founded, which is all the in Chinese-English and equipped with electronic version, records mainly Gansu economic and social development situation in 2015, but its statistics materials have traced back in time. III. The yearbook contains the following two parts: The first part contains special set, memorabilia, overview, politics, legal, national economy, construction and mapping , transport, communication and post, government finance and financial, economy management, social undertaking, people’s livelihood and county profiles 13 contents. The second part contains total 22 sections and chapters: General Survey; Population; National Accounts; Employment and Wages; Prices; People’s Living Conditions; Government Finance and Financial Intermediation; Resources and Environment; Energy; Investment in Fixed Assets; Foreign Trade and Economic Cooperation; Agriculture; Industry; Construction; Wholesale and Retail Trades; Hotels, Catering Services and Tourism; Transport, Postal and Telecommunication Services; Education & Science and Technology; Public Health, Social Services and Social Security; Culture and Sports; City; Ethnic Minority Autonomous Area. For the convenience of using information for the readers, statistics have a brief introduction at the beginning of each part. In addition, explanatory notes on main statistical indicators are provided at the end of each part. V. In comparison with Gansu Development Yearbook-2015, following amendments were mainly made in content of this yearbook: Overall follow the principle of “general survey & population & economy & society & region”, the order of the 22 chapters of the yearbook was comprehensive adjusted. The chapter of “Energy” is added the statistical table of energy consumption of per unit of product for key energy-consuming enterprises. The chapter of “Industry” is added the classification of stock cooperative enterprises, added the classification of micro-enterprise in enterprise size. Adjusted the relevant statistical indicators of the table of “Currency Balance Sheet of Financial Institutions’ Renminbi, Foreign Exchange, Foreign Exchange Credit”. Increased the main statistical indicators of ethnic minority autonomous area over the years. According to the latest statistical reporting system, the contents and related statistical indicators of the chapter of people’s lives and other chapters is adjusted. Gansu Statistical Yearbook is a large-scale annual statistical publication, which is edited by Gansu Yearbook Editorial Commission, and published by Chinese Statistical Press, released in both international and domestic market. It records development of politics, economy, law and society of Gansu on the basis of large amount of accurate and reliable materials. It is an important reference for Party and government leaders at all levels, economic management department, enterprises and institutions, research department, foreign and domestic investors to learn about basic situation on Gansu, and carry out scientific decision, consulting and research.